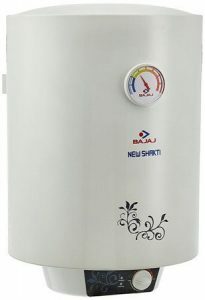 Water Heaters are one of the most popular appliances that find a place in every Indian household. During winters, no one wants to bath with the cold water. And so there comes this efficient appliance that offers the hot water ready for you within a short period of time. With the continuous enhancement in technologies, various companies now create multiple types and models of water heaters that will last for 12-20 years. Also, the improved water heater technologies that have emerged in the recent years give the homeowners looking to buy a new water heater with more choices than ever before. In this blog post, we came with some of the latest models of Storage Water Heaters with the capacity of 25 liters and improved energy efficiency than the older models. So, if you are looking for a quality water heater that comes under your budget too, just go through the list of water heaters described herewith. And pick the best one according to your budget and preference. This model of AO Smith is one of the most energy efficient water heaters you can buy with full trust. It comes with an enormous capacity of 25 liters which is sufficient to heat water for your entire family. It warms water fast, and the large storage capacity of it gives you a steady flow of warm water. This water heater/geyser is equipped with the double-coated glass-linked tank that ensures maximum protection against hard water and corrosion. Its blue diamond glass lining technology increases the life of the inner tank of the geyser. You can precisely set the temperature between 25-degree Celsius to 75-degree Celsius using the temperature control knob according to your need. A safety valve is designed herewith to automatically relieve and discharge water if in case the pressure exceeds the preset limits. Also, if the water temperature exceeds the highest preset level, the thermal cutout cuts off the power supply to assure safety. 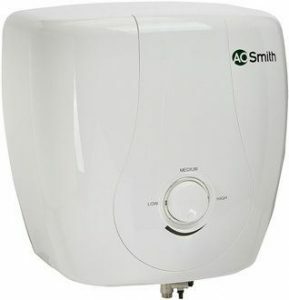 This is another best model of electric geyser from the brand AO Smith. When it comes to ultimate convenience to your bathing and washing needs, this is undoubtedly the best choice. Featuring a smart wireless remote control operation, it is very easy to operate. Also, with its advanced digital display, you can easily get all the vital information on its functioning. The very best part is that it comes with 5 Star BEE Rating that means now you don’t need to bother about the electricity bills. It consumes very less power and delivers excellent hot water with an amazing energy efficient process. This water heater comes with the high-performance glass coated heating element that offers instant hot water supply in no time. 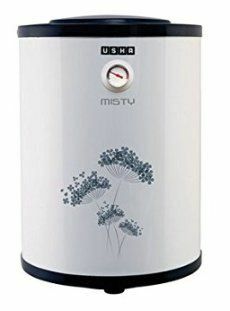 The Usha Misty 25 liters storage water geyser perfectly combines an aesthetic appeal, best-in-class technology, safety, and energy-saving features, as well as great performance-All in One. It is a great product satisfying your warm water needs in kitchen and bathroom. It comes with 5 Star energy rating that lets you cut down a lot in your electricity bill. This water heater is made up of high-quality steel with the inner tank coated with glass lining treatment to offer durability. Also, the various safety features like the thermostat and thermal cut-out with precise control of water temperature, a brass fusible plug for added safety to drain out water in case of excess temperature, etc. makes it the best choice to use in your bathroom. For all your water heating needs, this storage water heater is only the most reliable answer. 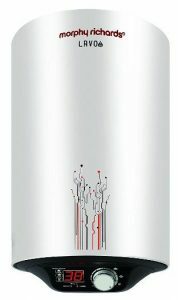 With the 25 L capacity, it provides you the easy and convenient hot water supply whenever you want. It comes with the hard and sturdy plastic body as well as the glass lined tank to prevent corrosion. This storage water heater gives prolonged hot water even after hours of heating up. The best is its 5 Star BEE rating that ensures the energy efficiency and power saving capacity, and so no more worry about the extended electricity bills. If you are looking for a utilitarian water heater for your day-to-day use, this Morphy Richards Lavo water heater will absolutely be your great choice. You can now take a warm shower whenever you want and without any hassles with this water heater. This geyser comes with a large capacity of 25 liters and consumes very little power. Its glass lined inner tank, a highly efficient glass-coated heating element, and an extremely energy-saving feature makes it out the best. With its effective temperature control knob, you can change the temperature accordingly. And the thermal cut-out feature makes it safe to use. 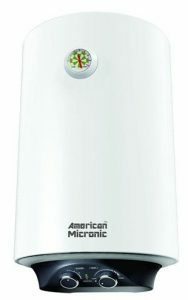 This American Micronic water heater is one of the best water heaters with a host of features. 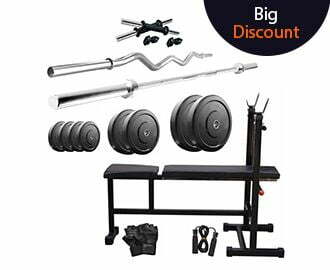 It comes with an ultra-thick inner steel tank to handle 8 bars pressure. Also, gives you maximum protection against the hard water and corrosion. This geyser is equipped with high efficiency, and long life glass lined heating element. This water heater is also equipped with multiple safety systems to protect against dry heating and over pressure. The automatic power cut-off features of this water heater ensure maximum energy saving. 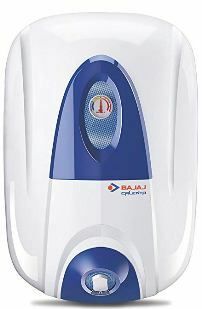 Get a refreshing warm shower whenever you want with this Bajaj water heater. This one is the best geyser for regular use and also consumes very less power. Its inner tank is coated with the glass lining that makes it highly effective Incoloy heating element. This water heater is also equipped with special protection device that gets rid of harmful salts and maintains the tank safe and healthier from corrosion. The multiple safety systems ensure the best protection against dry heating, overheating, and over pressure. 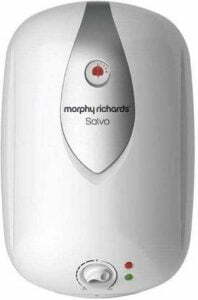 The Morphy Richards Salvo water heater with a capacity of 25 liters is among the most economical and long lasting water heaters in the market. If you are seeking for the best energy efficient water heaters, this one will absolutely be your great choice. And also it greatly saves your expenses on electricity. The capacity is 25 l which is adequate for a normal sized family. This water heater comes with the latest effective glass lined heating element, so you just don’t need to wait for long hours to get the warm water. It also has 8 bar working pressure that is even suitable for high rise buildings. 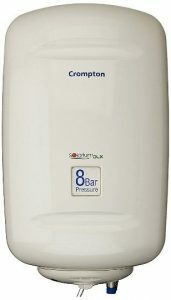 This Crompton Solarium water heater is an excellent choice for your everyday use. With a capacity of 25 liters, it can be used anywhere whether it be the home, hotel, PG, or guest house. Also, with the 4-star energy rating, it uses comparatively less electricity than the others and saves your electricity bill. You can heat a large quantity of water at a time and also at the faster rate with this efficient water heater. This water heater has a strong tank insulated coating which prevents the heat from escaping the container. And thus keeps the water for a long period of time. 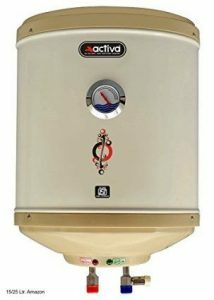 Out of many high capacity water heaters out there in the market, this water heater from Activa is one of the best. The material used in this water heater is top-notch which can last for more years. It comes with an anti-vacuum system, automatic thermostat, extra heavy heating element for longer tank life. A water pressure protection is also fitted with this geyser that saves the device from damage due to high water pressure and also helps in maintaining the pressure despite the height of installation. Water Heaters or geysers come in different variants each having their specific features and applications. Let’s have a look at the different types of water heaters or geysers. Immersion Heaters- Immersion heaters or immersion rods are the most popular as well as traditional heating devices to warm up the chilled water in a few minutes only. It comes with a long wire and the heating element to immerse in the bucket or container filled with water along with a clip to hook it easily. Just plug it on and heat up the water according to your need. It is also an economical option over other heating appliances. Water Heaters with Storage- These are also known as electric water geysers with a storage tank of varying capacities ranging from 3 – 6 L, 7 – 10 L, 11 – 15 L, 16 – 25L, and above 25 L. These are suitable for large capacity requirements and also offer the more comfortable shower. The best is that it has the longer lifespan. Instant Water Heaters- Instant water heaters or instant geysers works the same way like electric water geysers but are suitable for small capacity requirements. It heats up the water instantly as soon as you switch it on. These are portable units and very energy efficient. It comes in an appealing wall-mountable design and is ideal for washing utensils, hand wash, and bathing using a bucket. Gas Geysers- Gas geysers are the most latest type of water heaters that heat up the water using LPG for our day-to-day warm water uses. It is the most convenient option for large families with an easy and simple installation and saves a huge cost of electricity bill per month. Size and Design- This is the foremost thing to consider before buying a geyser. The newer model comes with the most stylish and classy design that perfectly goes with your bathroom decor. And when it comes to size, choose the one that fits your bathroom size. Water Heaters or Electric Geysers come in wall mountable design, some are horizontally mountable, and some are vertical. So go for the one suiting your needs. Capacity- This one is another important feature to look for in a geyser or water heater. We have already discussed about the capacity range of storage water heaters in the above section. So, if you have a small family, smaller capacity of the water heater is best. And for the large family requirements, water heaters with large capacity are more preferable. Energy Star Rating- The latest models come with star energy rating that you must check before buying a geyser. Higher the star rating higher will be its energy efficiency. It means the good star rating models cut down a lot in your electricity bills. Auto-Cut- This point is more considerable for safety point of view. The geyser switches off automatically once the water gets sufficiently hot. It not only saves the energy but also maintains the durability of the heater element, thereby increasing the lifespan of a water heater. Thermostat- This is also an essential feature that lets you control the temperature of water. With a controlling knob present in the geyser, you can adjust the temperature accordingly. Some high-end models also come with the digital meters to display the accurate temperature of water. Geyser for Hard Water- If there is a hard water source means water with more salts, you must go for the one having corrosion resistant tank to protect the heating element from damage. This is all about the best energy efficient water heaters with the capacity of 25 liters. Since, in the winter season it is extremely challenging to take the morning showers with the cold water. And also we feel lethargic to take a bath when the water is cold. So just get your perfect pick from the above-mentioned water heaters and enjoy a warm bath every time whenever you want.